The graphic here (and at the bottom of this post) is a good representation of how the skill sets needed for data literacy intersect. I think some of us worry that we don’t have the necessary statistical literacy in particular to really feel data-literate, but if you are someone who thrives on orderly arrangements of information—perhaps a library classification system?? –you are fine! Orderliness goes far, as does a critical eye towards credibility, currency, reliability, and all those other good criteria we use to assess information every day. Those are essentially the messages of this piece, “Become Data Literate in Three Steps”. 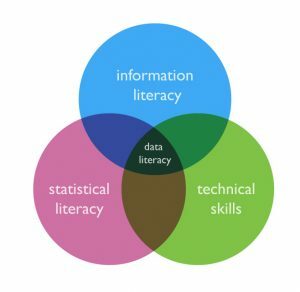 Convinced it’s worth learning more about data literacy? For fun, check out the HipHopLibGuide’s Data Literacy page. Because, speaking data-wise, who DOES have the largest Hip Hop vocabulary?